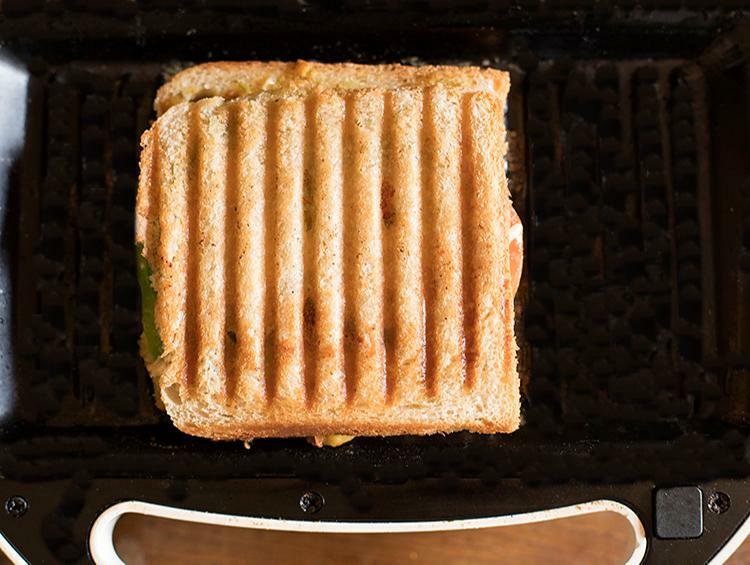 quick toast or grilled sandwiches made with leftover chickpea curry. 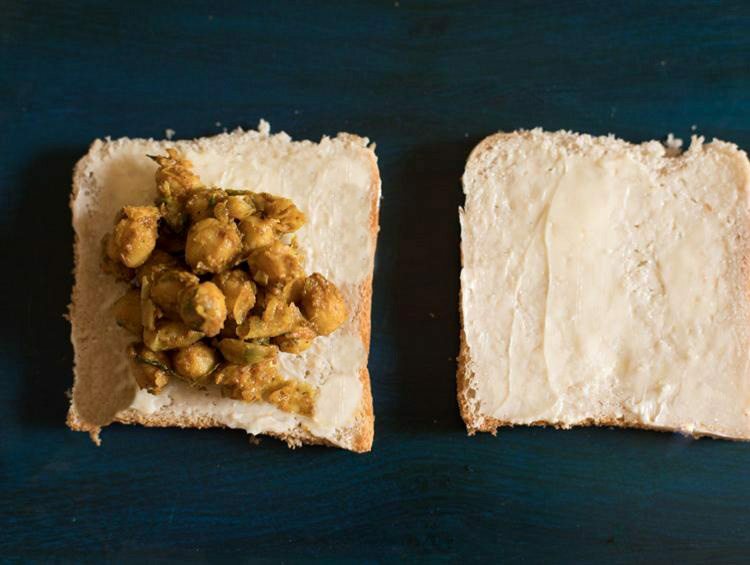 chana sandwich recipe with step by step photos – at my home chana masala or chole is often made and on some days when there are leftovers, i make this delicious chana toast sandwich recipe. 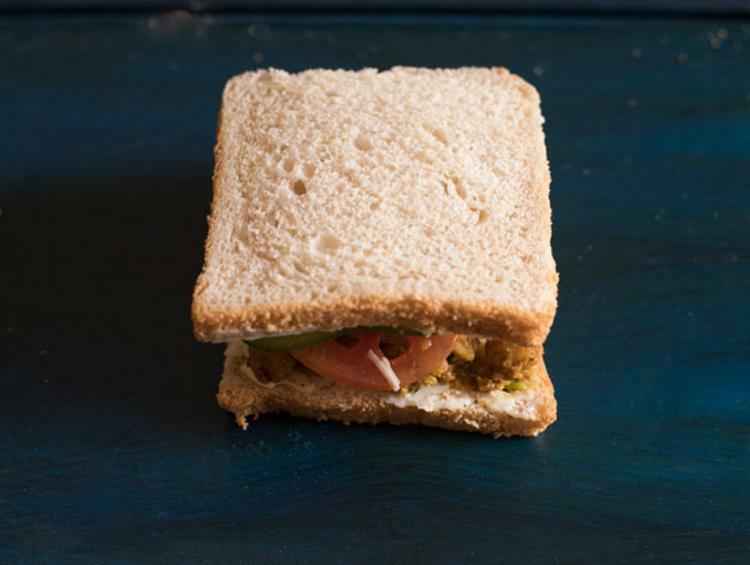 this chana sandwich recipe can be made with leftover rajma (kidney beans) or lobia masala too. just keep in mind that the gravy or curry has to be semi dry or dry. 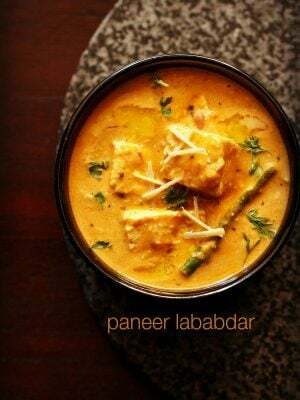 using leftover curries or vegetable dishes in sandwiches or parathas is a good way to use leftover food. if you love sandwiches then there is rajma sandwich and aloo sandwich recipe also on the blog. 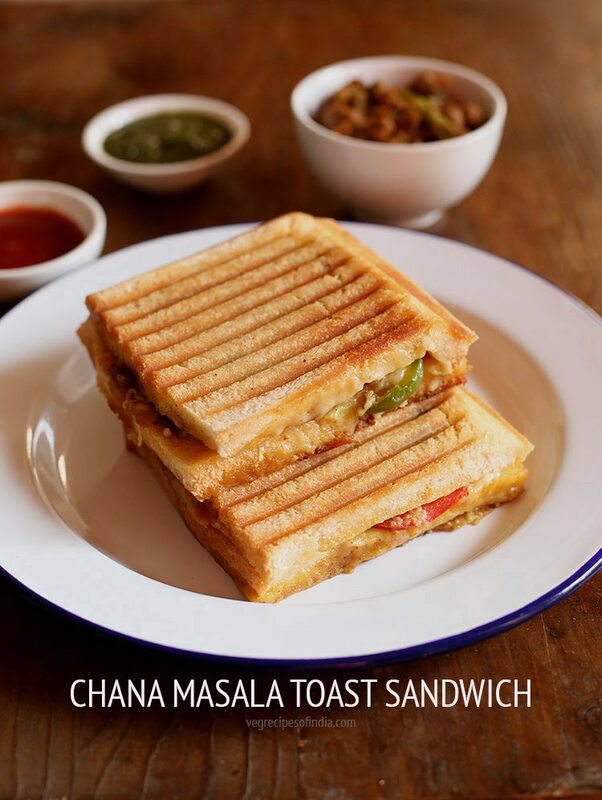 when i make this chana toast sandwich i always spice it with chaat masala and roasted cumin powder. 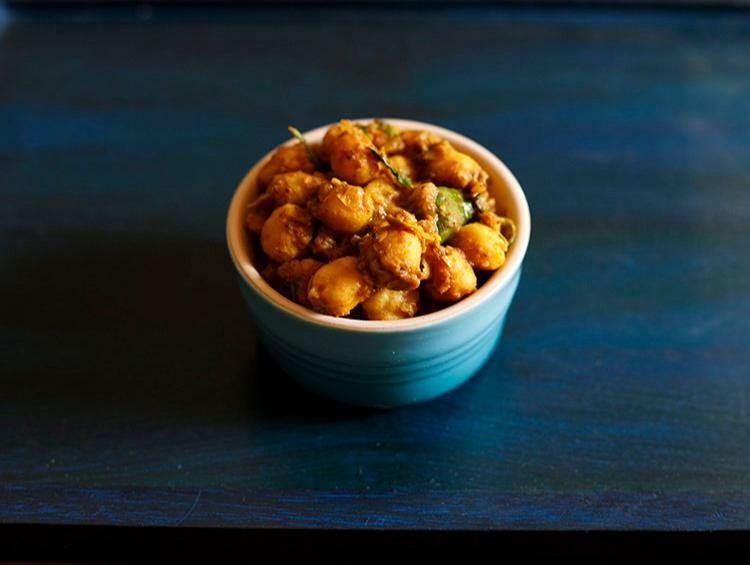 chana masala is itself a heavily spiced dish, so i use less strong spices for the toppings. i also add veggies like onions, tomatoes and capsicum to these sandwiches. 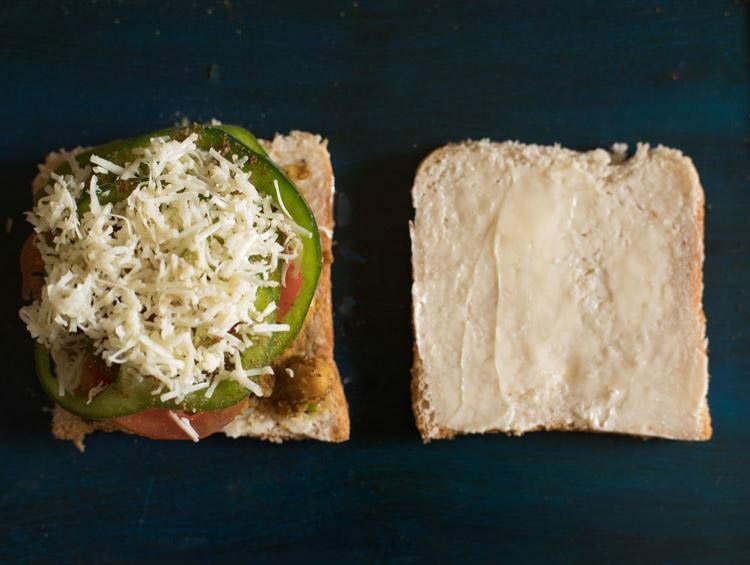 you can also add cheese slices or grated cheese to the sandwich. sometimes i do this way for the hubby. i also make a vegan version of this sandwich by using olive oil instead of butter and also skip the cheese. 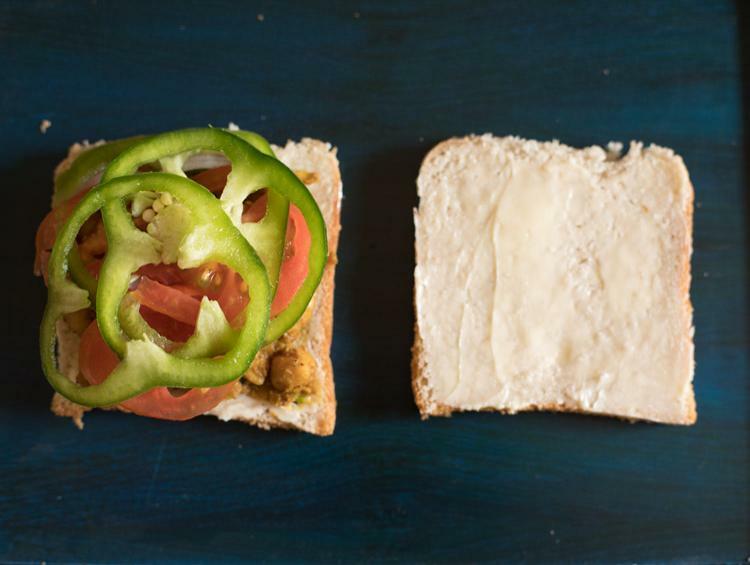 so you can easily veganize these sandwiches too. i made these chickpeas sandwiches in an electric sandwich toaster/griller. 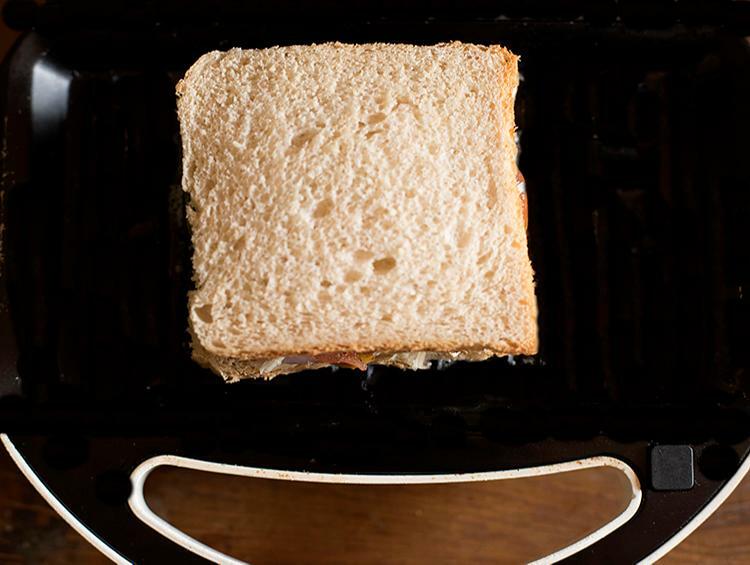 you can use a non electric sandwich maker or grill to make these sandwiches. 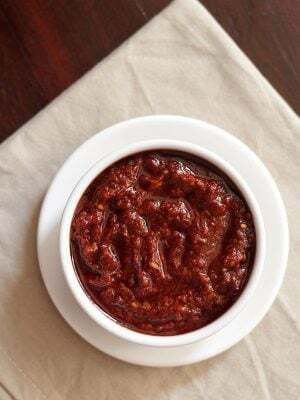 the chole sandwich can be served with green chutney, sweet tamarind chutney or tomato sauce. trim the edges of the bread if you want. spread the butter or brush the olive oil lightly on all the bread slices. add 1 or 2 tablespoon of the chana masala. top with 2 to 3 slices each of onion, tomato and capsicum. sprinkle with a pinch or two of chaat masala, roasted cumin powder and salt. if you want you can top some grated cheese also on top. 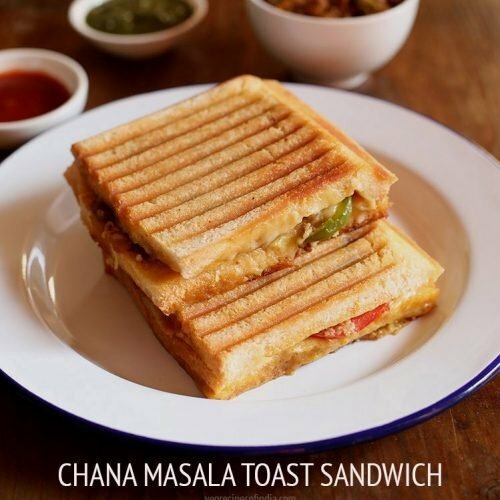 toast the chana sandwich in a sandwich maker or grill till golden and crisp. spread some olive oil or butter on top of the chole sandwiches if required. 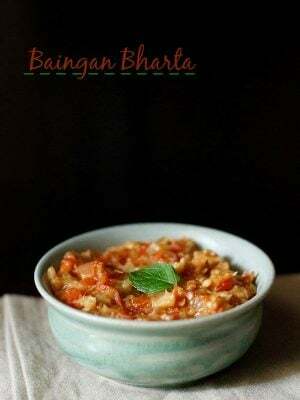 serve the chana sandwich hot with green chutney or sweet tamarind chutney or tomato sauce. 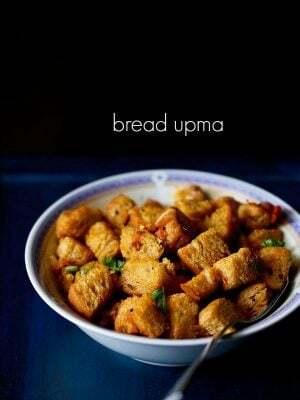 1. keep ½ to ¾ cup chole masala ready for stuffing in the sandwiches. i have used leftover chickpea curry of previous day for this sandwich. 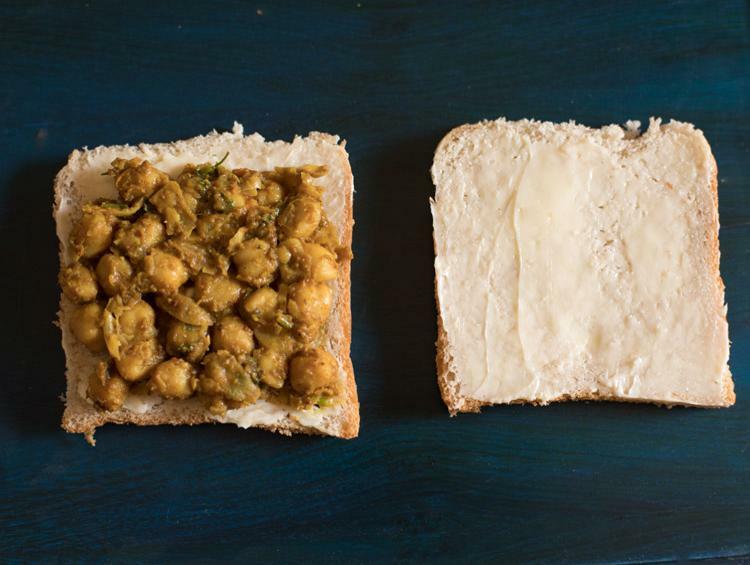 just ensure the chole masala is dry or semi dry else the sandwiches may become soggy. 2. slice thinly, 1 small to medium sized onion, 1 small to medium sized tomato and 1 small green bell pepper (capsicum). 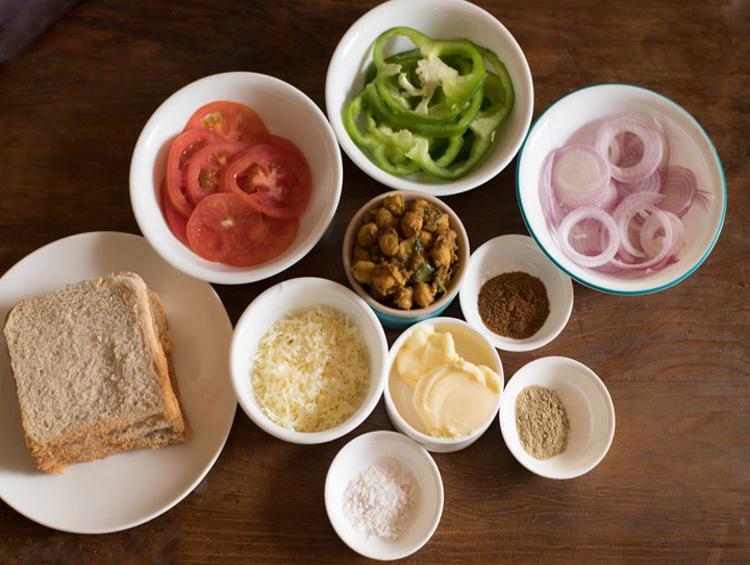 measure all the ingredients and keep ready for making chickpea sandwiches. 3. spread the butter or brush the olive oil lightly on all the bread slices. trim the edges of 4-6 bread if you want. i have here used whole wheat bread but you can use multi grain bread, white bread or brown bread. 4. add 1 or 2 tablespoons of the chickpeas or chana masala. 5. spread the chana with the back of a spoon on the bread. 6. top with 2-3 slices each of onion, tomato and capsicum. 7. sprinkle with a pinch or two of chaat masala, roasted cumin powder and salt as required. 8. if you want you can top with some grated cheese (optional). 9. cover with another slice of bread. 10. apply some butter on both sides of the electric toaster. 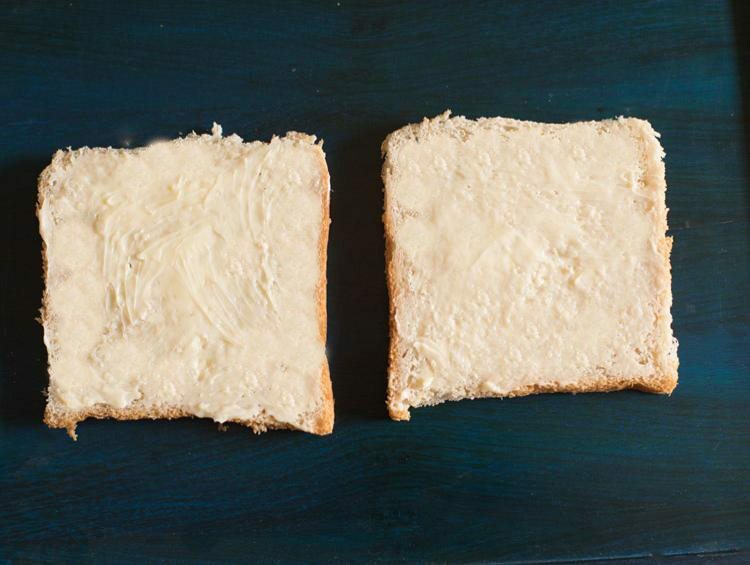 alternatively you can apply butter on top of the bread before toasting them. applying butter is optional. i prefer to apply butter on the sandwiches while serving them. 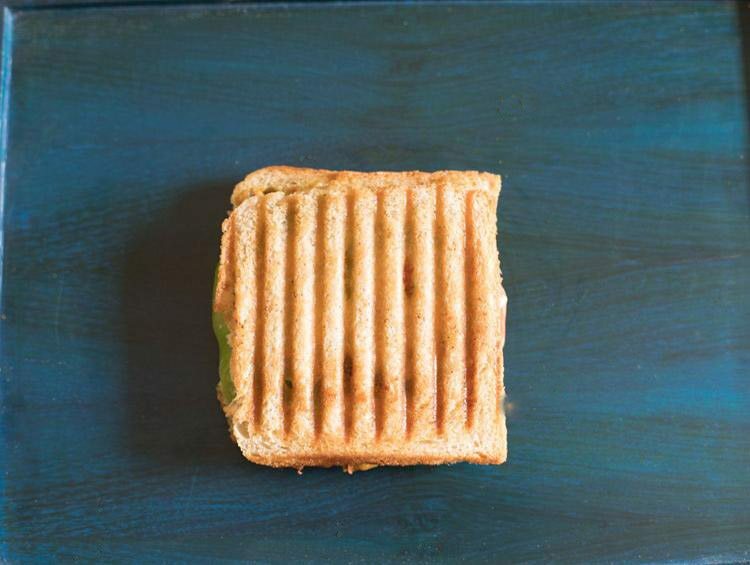 11. toast the chana sandwich in a sandwich maker or grill maker till golden and crisp. you can also use a hand held sandwich maker or toast the sandwich in a pan. 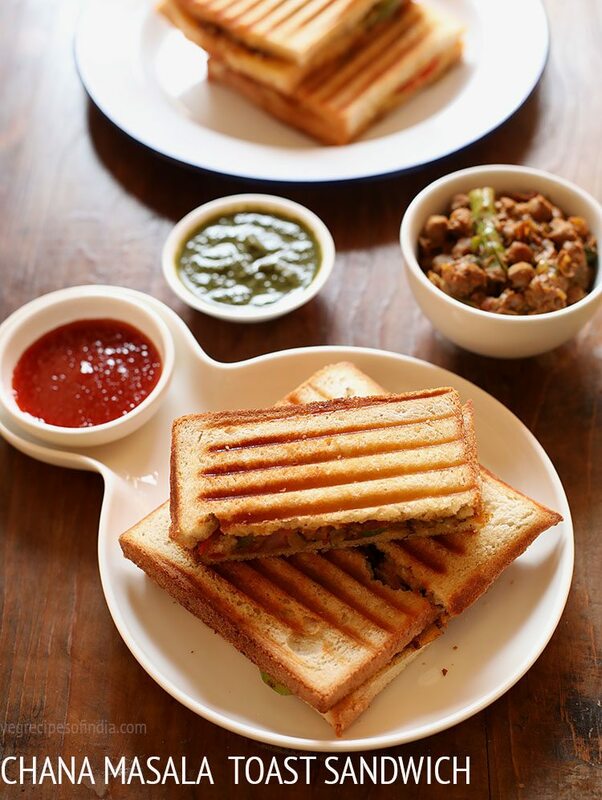 12. gently remove the toasted/grilled chana sandwiches on the serving plate. 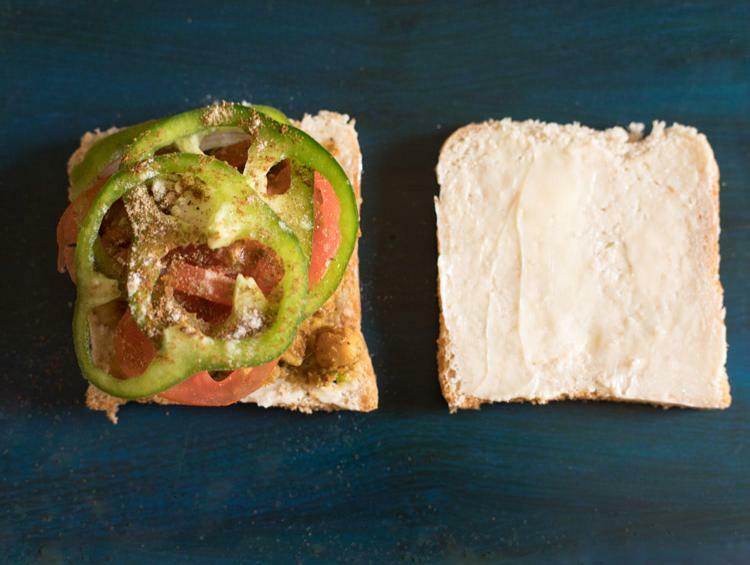 spread some olive oil or butter on top of the sandwiches if required its optional. 12. slice into triangles or squares. 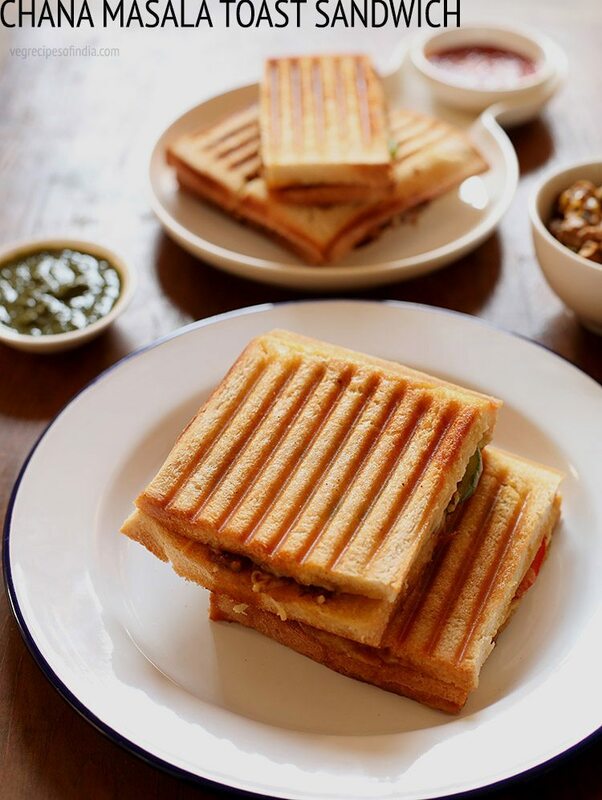 serve the chana sandwiches hot with green chutney or sweet chutney or tomato sauce. Hi, your recipes are really good. 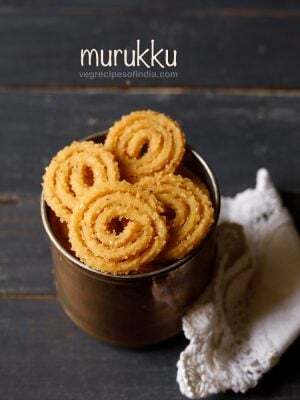 i need a suggestion from you, i am planning to buy a oven but i am confused which one to buy, i am looking for something where i can use for all purpose like baking cakes, cookies, breads, etc etc but i dont think microwave is apt for all, which one should i go for..? i currently have a philips OTG and its a basic model. you will get various other brands too. 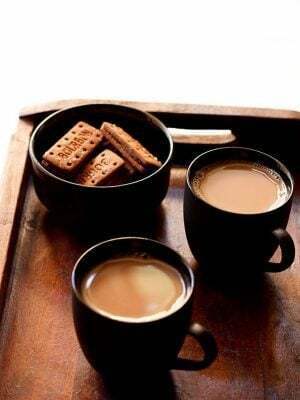 check with the dealer or on the web which brand is good and then buy it. microwave is good for microwave cooking as well as baking. but personally i prefer to bake in an OTG than in a microwave oven. OTG is good for baking various stuff like breads, cookies and cakes.